The purpose of grafting is to combine one plant's qualities of flowering or fruiting with the roots of another that offers vigour and resilience. This is a difficult task and requires lots of skill and practice. In most cases, trees and shrubs are available to buy already grafted onto a rootstock. It is possible to graft a wide range of ornamental plants. Credit:RHS/John Trenholm. If they were grown on their own root system, many would be too vigorous. Cultivars will not usually come true from seed. A fruiting plant can be produced in a shorter period of time. A weak-growing cultivar can be invigorated. It is difficult to propagate by other means, such as cuttings or cultivars do not come true from seed. In order to strengthen plants that grow weakly on their own root systems. In order to produce a larger flowering plant in a shorter period of time. Acer palmatum, Hamamelis, Wisteria, Thuja and Picea are examples of commonly grafted plants. 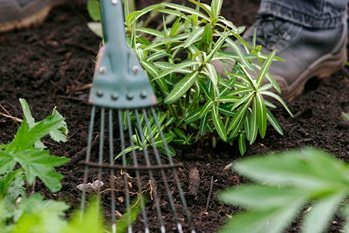 Ornamental plants are usually grafted in early spring before the sap starts to rise, but it can also be done in autumn. Fruit trees are grafted at different times of year, depending on the technique. Chip budding and T-budding are undertaken from mid-summer into early autumn, while whip-and-tongue grafting takes place in late winter or early spring. Most plants need to be grafted within their own species i.e. Acer palmatum cultivars onto an Acer palmatum rootstock. However, it is sometimes possible to graft within a genus i.e. Acer japonicum, A. circinatum and A. shirasawanum can all be grafted onto Acer palmatum rootstock. A few plants can be successfully grafted onto different species, providing they are within the same family. For example, Fothergilla onto Parrotia rootstock, as both are in the Hamamelidaceae family. For grafting pines, a rough rule of thumb to remember is a five-needle pine can be grafted onto a five-needle pine. The same applies for three and two needle pines. There are always exceptions to these rules and it can be a case of trial and error. The most important things to remember when attempting to graft a plant is to use healthy material, have a very sharp knife that is regularly sterilised, and cut straight so surfaces meet flush. Side-spliced grafting is usually undertaken in late winter or early spring before bud break. Scion-wood should be from healthy one- to two-year-old wood. The best rootstocks are two-year-old seedlings, ideally about pencil thickness. Cut the scion wood just above a bud into 15-25cm (6-10in) lengths. Cut the rootstock down to about 7.5cm (3in). Make a downward nick about 3cm (1¼in) below the top of the rootstock. Then, starting at the top of the rootstock, make a downward sloping cut to meet the first cut. Remove the slither of wood. Take the scion-wood and make a cut along one side the same length as made on the rootstock. Make a short angled cut at the base of the scion wood. Fit the base of the scion wood into the rootstock so that the cambiums (green layer just beneath the bark) meet. It is preferable that they touch on both sides of the stem, but usually satisfactory if they only meet on one side. The key to grafting is to make straight cuts so the rootstock and scion fit snugly. The graft should then be wrapped with grafting tape, polythene strips or raffia and any exposed cut surfaces painted with grafting wax. If possible, place in a propagator or greenhouse. Do not over-water the compost but mist regularly. If successful, the graft should start to show new growth in about six to eight weeks. This method is used for the production of fruit and some ornamental plants. It is normally undertaken in March or early April on rootstocks planted 12 months previously. This technique uses two cuts on both the scion and rootstock, which enables the two parts to be 'locked' together. This gives a structurally strong graft suitable for field conditions. In December or January select healthy and vigorous shoots from the scion tree. Note that both rootstock and scion material need to be about the same diameter – preferably 2.5cm (1in). Remove a 23cm (9in) length by cutting just above a bud on the tree. Bundle five or six scions together and heel them into a well-drained, sheltered site, leaving 5-7.5cm (2-3in) showing above the soil. This will keep them moist but dormant. Alternatively, wrap them up in a dry plastic bag and keep them in the fridge until spring. In February, before bud break, cut the top off the rootstock at about 15-30cm (6-12in) above ground level and trim off the sideshoots. Make a 3.5cm (1½in) upward-sloping cut on one side that exits half way through the stem. Follow this with a downward cut, one-third of the way down the exposed face of the first cut. Make this 0.5cm (¼in) deep to form the ‘tongue’ into which you will insert the ‘tongue’ of the scion. The scion (three to four buds long) is prepared by making a flat sloping cut 5cm (2in) long, just behind a bud. Follow this with an upward cut 5mm (¼in) deep to form the corresponding ‘tongue’. Both are brought together with the tongues interlocking. Match the two cambiums together as well as possible and bind firmly with grafting tape or raffia. Remove this when a callus is clearly visible (about eight weeks later). Generally, failures occur when the callus between the scion and rootstock does not form. This can be due to poor cutting and joining, or inferior quality plant material. However, a few loses are to be expected. However, sometimes graft unions can fail many years after they were, seemingly, successfully made. Wisteria is a common example of this, and the reason is usually given as 'graft incompatibility'. See our advice in Wisteria for more detail.